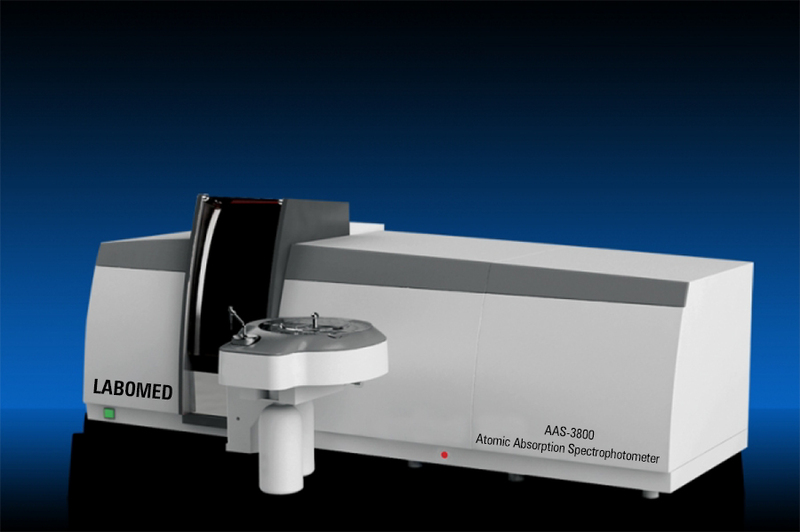 Atomic Absorption Spectrophotometer AAS-3800 is a high performance automated instrument designed to meet the requirements of the modern laboratory. Due to its versatility and performance it can be used for a wide range of applications including: Agricultural, Clinical, Environmental, Food, Metal, Mining, Geological, Petrochemical, and Pharmaceutical. The Fully Automatic Fast Sequential Multi-Element Analysis Flame Atomic Absorption Spectrometer system is equipped with an EIGHT Hollow cathode lamp motorized turret Atomic Absorption Spectrophotometer. All electronics, analytical data and gases are fully controlled via the AAWin3 Software for maximum safety and optimum performance. 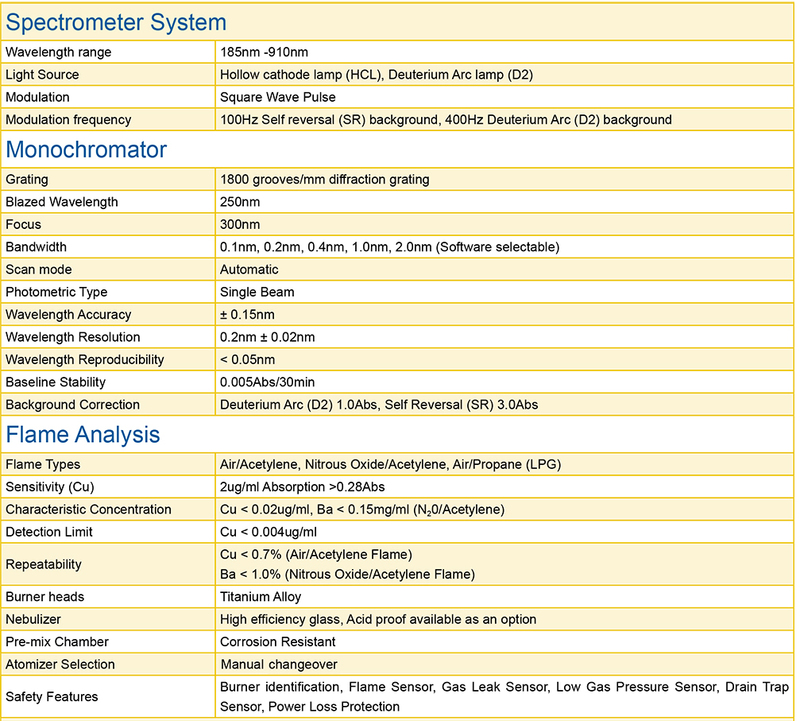 A data coded Air/Acetylene Burner is included. (Nitrous Oxide/Acetylene and Air/propane data coded burners are also available as optional extras). The instrument is equipped with a flame atomizer only. 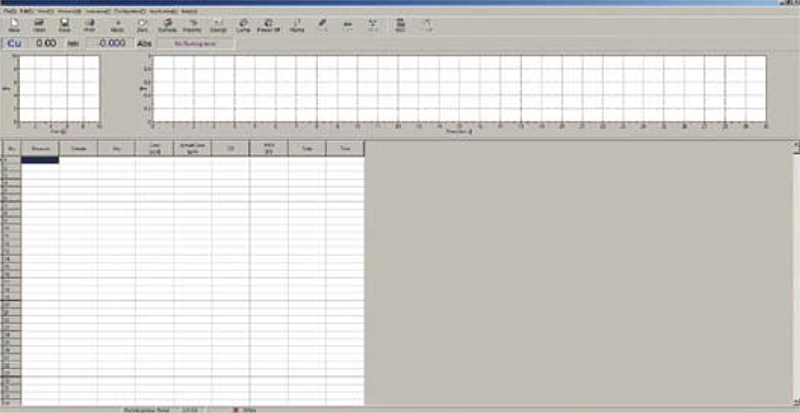 The positioning of which is fully controlled by the embedded computer system and the AA-Win Pro software. Three flame options are available to the user with the Air/Acetylene being the standard configuration. This flame can be used for nearly all standard elements while the N20/Acetylene and the Air/LPG (Natural gas) are available as an option for the more demanding of elements. All three flame configurations offer a coded burner for full safety protection. 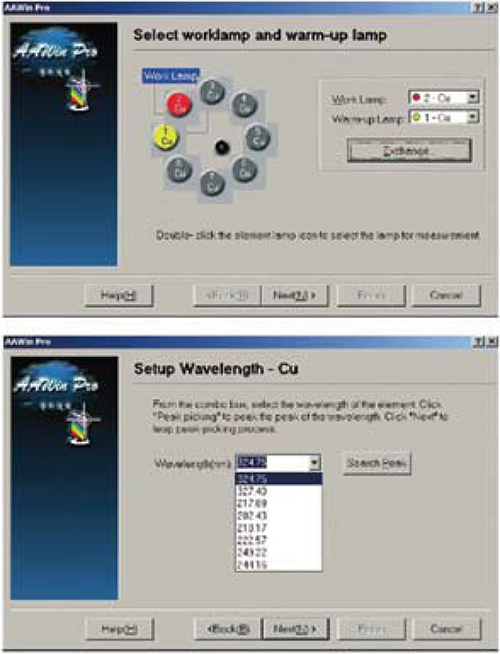 AA-Win Pro software provides full control of the in- strument and autosampler with easy method change for each technique. Automatic 8 Hollow Cathode lamp turret controlled and optimised by the AA-Win Pro software. Operat- ing lamp current and warm-up lamp current can be individually controlled to eliminate drift commonly as- sociated with lamp warming. D2 lamp background correction system fitted as stan- dard to all configurations. High energy D2 lamp and adjustable beam splitter mirror are optimised by the AA-Win pro software. Self Reversal background correction system fitted as standard to all configurations. The high performance background system uses the same hollow cathode lamp as installed for the analysis. 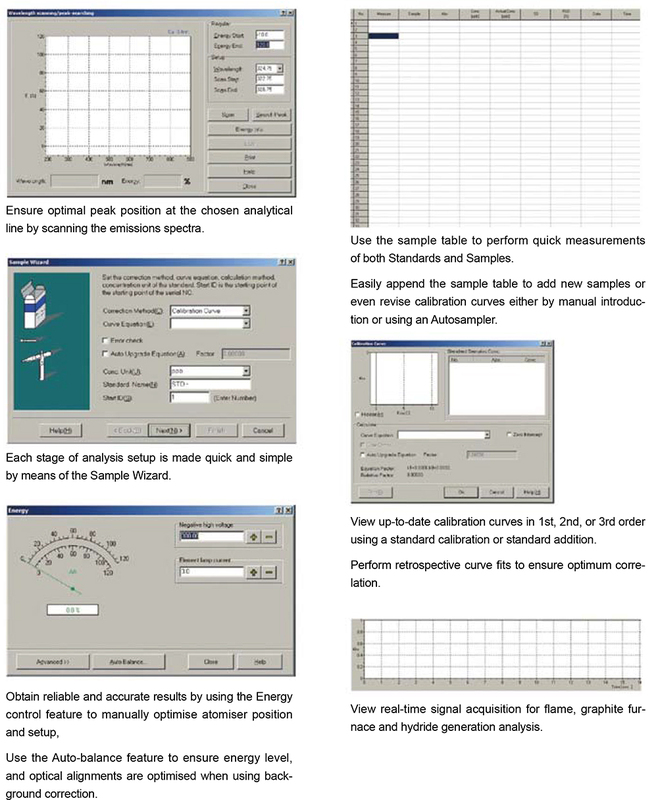 Minimum extra com- ponents are required and optical alignment is very simple. Self Reversal can be used for any element at any wavelength making it extremely versatile. A universal autosampler is available as an optional accessory which is conveniently mounted on the front of the AAS-3800 instrument. The high sensitivity (Cu 2ppm >0.280abs) is due to the efficiency	of the fixed position glass nebuliser fitted as standard. An acid resistant replacement is available as an option.